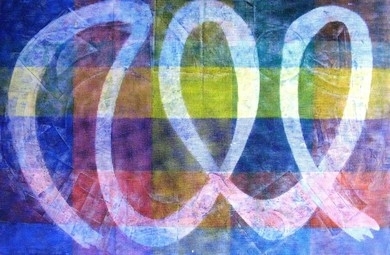 Mono Printing lies in the area between painting and printmaking. A flat surface (i.e. glass or a mirror, etc.) is used to draw a design/image on using paint or ink, either painted on or applied with a roller. The layer of ink is either drawn into or wiped away. An impression is taken by placing paper over the inked or painted surface and then rubbing or burnishing the back of the paper, the pressure of the burnishing adheres the image to the paper, usually one impression is taken hence the name mono print, however two or even three impressions can be made. There are a variety of ways to make mono prints. The workshops at artsawa will cover these various processes.